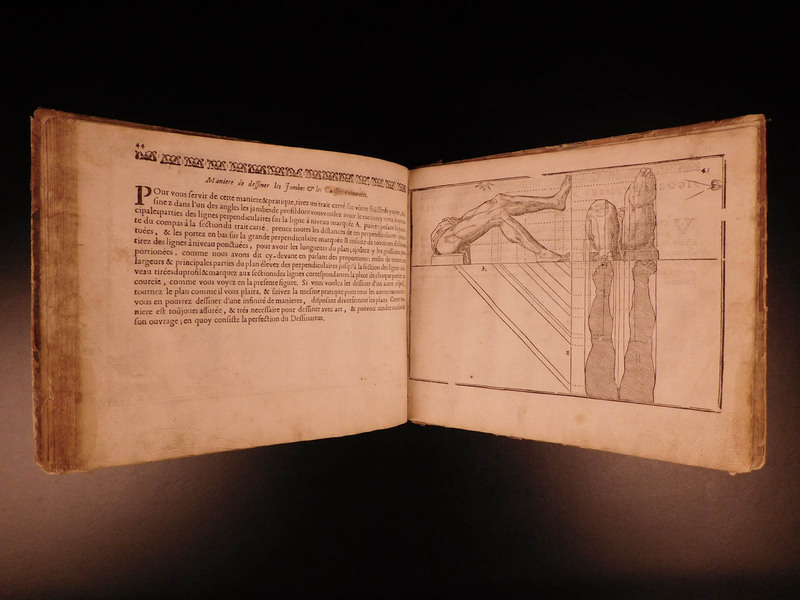 A rare 17th-century edition of Jean Cousin’s, a 16th-century French painter, ‘Science of Portraiture.’ While this book was initially intended to be an instructional manual on drawing the human form, it quickly became as famous, or more so, as his father’s ‘Book on Perspective’. The Cousin name was synonymous during the 16th-and 17th-century with painting and sculpting. Their art books were so popular that there are no known existing copies of any of the 1571 or 1589 editions left today! No other books are as famous or well-known in the artistic-anatomy field as these! Francois Jollain was an important art book publisher who prints were integrated into the lecture notebooks of art students in Paris. Jollain took it upon himself to ‘update’ and reissue Cousin’s drawing manual ‘The Art of Portraiture’ in 1686. (Berger). L’art de dessiner de maistre Jean Cousin. A Paris, Chez François Jollain, . References: Berger, Art of Philosophy, p. 120.